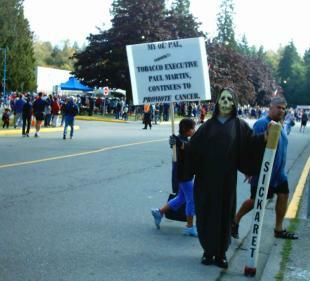 I accompanied the Grim Reaper at the Terry Fox Run in Port Coquitlam on September 18. The Grim Reaper has a long history of showing up wherever the consumption of tobacco products is being promoted. A few years ago, he was a regular at the Benson and Hedges Symphony of Fire and the Du Maurier Jazz Festival. He also showed up when former UK Prime Minister Margaret Thatcher, who became a consultant for Philip Morris after she left office, came to Vancouver for a speaking appearance. 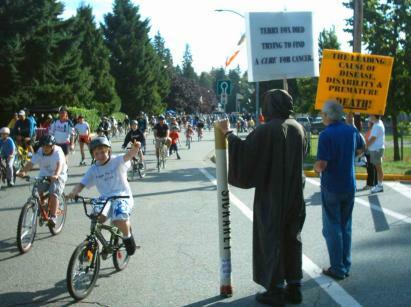 The consumption of tobacco certainly wasn't being promoted at the Terry Fox Run. Locating a lit cigarette there would have been a challenge. The Reaper's visit was prompted by the presence of Gordon Campbell, who has a deplorable record on tobacco issues, and Paul Martin, who is a former employee of the tobacco industry. One of Martin's first acts when he became Finance Minister in 1993 was to reduce taxes on cigarettes. It wasn't enough just to reduce federal taxes on cigarettes, either; he pressured Ontario and Quebec to reduce their taxes on cigarettes, too. The excuse for doing this was that reducing taxes would reduce smuggling. However, the cause of the smuggling was the tobacco industry. RJR employees have served time in jail for their involvement in it, and JTI-Macdonald was recently taken to court by the federal government in an effort to recover $10 billion in lost revenue due to smuggling. As always, the response to the Grim Reaper from passers-by was overwhelmingly positive. There were, however, a few people who complained that the Terry Fox Run is not a political event. Sorry, but the presence of Martin and Campbell makes it a political event. And since the Terry Fox Run is about finding a cure for cancer, it's entirely appropriate to raise the issue of Paul Martin's involvement in the leading cause of cancer, which is cigarettes. There were also some people who questioned the effort by the Grim Reaper and Airspace Action on Smoking and health to draw attention to the cause of cancer instead of the cure. Well, I have no doubt that the money raised by the Terry Fox Foundation is well spent. I know that the Foundation provides substantial funding for the BC Cancer Agency. Airspace, along with similar organizations like Physicians for a Smoke-Free Canada and Americans for Nonsmokers' Rights, has a different emphasis. Cigarette smoking is the single most preventable cause of premature death. The blame for this has to be placed firmly upon manufacturers of cigarettes and those who collaborate with them. This is the message that the Grim Reaper and his acolytes brought to Port Coquitlam on September 18. It's a message that makes some people uncomfortable. Perhaps that's because it's a message of common sense; the most effective way to reduce the incidence of cancer is to reduce the amount of carcinogens that go into peoples' bodies, and that includes cigarette smoke.